50 Books to read before you die! My latest read was fuelled by a desire to conquer my fear, a genuine attempt at tackling one of my long-standing fears head on. 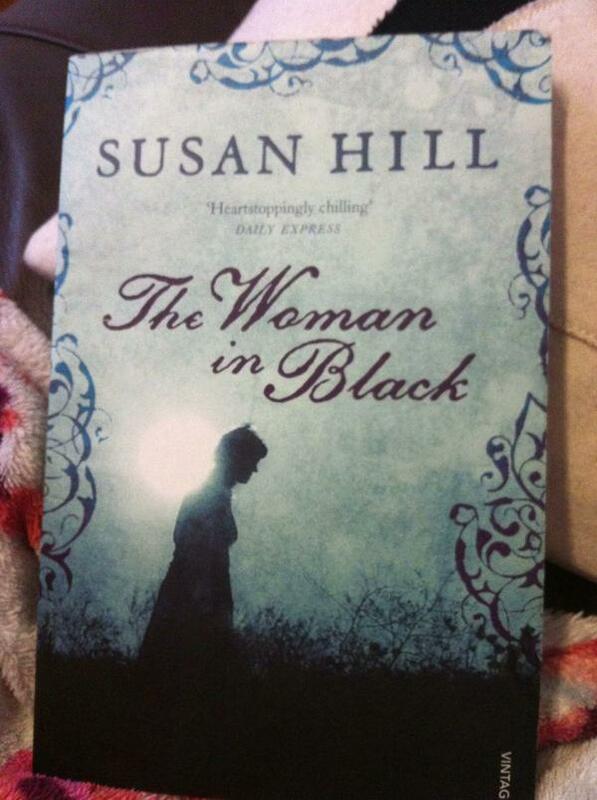 So I read The Woman in Black by Susan Hill. Firstly let me clarify that I have had a fear of The Woman in Black since I was 16! My first encounter was seeing the play at the theatre with the rest of my Drama class. As much as I could tell you what an amazing performance it was, and how the minimalist effects were perfectly executed- it was so much more. It was an outstanding performance which has successfully cemented a fear in me of The Woman in Black. Just thinking about it makes me shiver, and afterwards I had nightmares for 2 months. Now that’s some performance! Then there came the film with Daniel Radcliffe in the role of Arthur Kipps. Admittedly there are differences between the film and the theatre adaptations, but these were to be expected. But the film succeeded in re-instating my fear of The Woman in Black, and taking it to a whole new level. The film brought The Woman in Black’s dreadful and terrifying face right into my personal space- I must get round to writing a thank you card to the relative who bought me the DVD! To this day there are parts of that film that I have not been able to watch, simply because I was able to watch the sequence leading up to it, and then my nerves gave out and the cushion moved in front of my face, so fast it’s become a permanent reflex whenever The Woman in Black is mentioned. It wasn’t until I saw my brother with a copy of Susan Hill’s novel The Woman in Black, that I then realised that both the film and theatre productions are adaptations from an existing work; therefore I’d done it all backwards! So moving on to my most recent encounter with The Woman in Black….Susan Hill’s novel was much more subtle and eerie than I imagined. She successfully depicts the drab and desolate Eel Marsh House so poignantly that it’s an image hard to forget. I didn’t know what else to expect from the novel, but I enjoyed the reminiscent ‘retelling’ perspective. Whatever horrors the story revealed, there was a survivor, able to tell the harrowing tale in great detail. Somehow when reading Kipp’s tragic story, it hit me much harder than it did when I saw the play or film- and don’t forget the film ends completely differently to the book. Hill shows literary skill in creating such an ordinary character, whose life bears no resemblance to my own; and yet throughout the novel I cared for him. I cared for his welfare; for his sanity and for his family; almost as much as I care for my own. What many readers forget in heavy action or mystery novels are the easy to miss, mundane and everyday occurrences. But rather than skip these events, Hill uses them to build her readers a solid picture of Arthur Kipps; giving us a reliable and believable centre for the plot. The relating of normal, everyday events makes the supernatural events starker than they would have been if the entire novel was littered with them. In fact I was surprised by the end, when you count the relatively few encounters Arthur Kipps has with The Woman in Black, the affect those encounters had not only on Kipps but myself as well…if you’re not even slightly shaken by the retelling of Kipp’s story, then you’re made of stronger stuff than me. I did find the ending a little bleak as it seemed to just tail off into nothing. It did end for Mr Kipps at least, that much was clear. But it was a little abrupt; it’s not quite a cliff-hanger so there’s no build up or expectation for a second novel; but you don’t get much satisfaction in it either. I suppose I shouldn’t have expected more from a thriller/ horror novel, but I did want more for poor Mr Kipps. Did reading the novel put my fears to rest? Well not so much, for a few nights I was jumpy amongst the hallway shadows. But I did feel I understood Arthur Kipps and his story much better, and enjoyed the experience whilst reading it. Those chapters which delved into the back story of The Woman in Black were fascinating, I simply wanted to get to the bottom of the mystery- I wanted to be able to put her spirit to rest. When a book can give you the same chills as a play or film, then you know you’re onto something good! I’d really like to read “The Woman In Black” and thoroughly enjoyed your review. I felt that the film was a huge let down! Apparently, the West End play is very scary! I enjoyed the Woman in Black book and also the film. At first i thought the movie would not be as thrilling, yet it was! I’ve heard of the film, and now I’ve heard o+ the book! I will never ever pick this up simply because it will freak me out so much, I might never be able to sleep again. I’m okay with horror/paranormal movies but not books. They’re too vivid for me and push my brain to overdrive! I did it backwards as well, I had never heard of the book before I went and saw the movie. I was thoroughly annoyed with the fact and went and got the book immediately, though my copy came with an audio book. Most audio books I can’t stand, it isn’t them, it’s the fact that my mind can’t pay attention to it. I find myself loosing myself in sheer nothingness and then having to rewind because I missed important stuff. The Women In Black though, that audio book chilled me. I recommend it, just to push that fear a little bit more. I feel the exact same way you did about the Ending! I felt really disappointed! From how you talk about Horror, I don’t think the Movie Adaptation is for you, but if you ever pluck up the courage, it is a fantastic movie! And I feel like it has a lot more plot than the Book! I loved reading your review! I’m really intrigued to read this book now that I’ve read your review. The movie absolutely terrified me — and I love horror movies — but I didn’t know the book existed. Thanks for the info! The movie was thrilling as well as the details you had said. I really liked how you used your own words to describe this. I remember reading that when Susan Hill first wrote it and had someone type it up/format it for her, that the person would refuse to do it unless she was in the kitchen with all the lights on and people chatting around her! I welcome contributions on any subject relating to books, reading, publishing, fiction, creative writing, self-publishing and anything in between. Read a ground breaking article, or read a great (or not so great!) book? Is there a relevant 'hot topic' in the media you want to discuss? Share your thoughts, ideas and opinions with us! Submit your blog post for consideration using the Guest Blog submission page. If Books Could Blog · The written word is the only saviour this world needs.